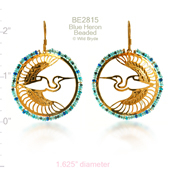 Introducing our bold and beautiful Beaded Blue Heron Earrings! These stunning earrings make a dramatic statement and are sure to make you stand out from the crowd! Featured here in 14k gold-plate with 14k gold-fill earwires, this style is also available in a rhodium (silver) finish and sterling silver earwires.